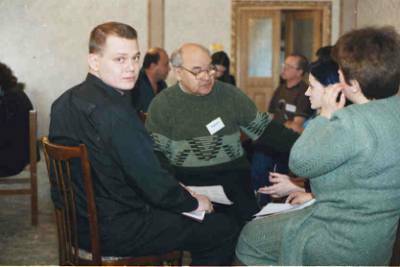 At the request of the Department on Relations with the Public and Confessional and Interregional Relations of the Nizhnij Novgorod Administration the training course in Nizhnij Novgorod was planned to take place on the 19th and 20th of February that is working days. Maksim Plescheev and Igor� Simonov, the substitute chairmen of the Department participated very actively in the organization and realization of the training course. At Maksim�s suggestion we decided to carry out the training course in a pension in the suburban colony �Zelyonyj Gorod� (Green Town) in a distance of 30 minutes from Nizhnij Novgorod. Like in Samara, the arrival of the participants in front of the Administration building was fixed at 4 p.m. the day before the training. Already in the bus it became visible that not all participant have known each other. Only two of the 15 participating leaders of national communities had taken part in previous trainings. 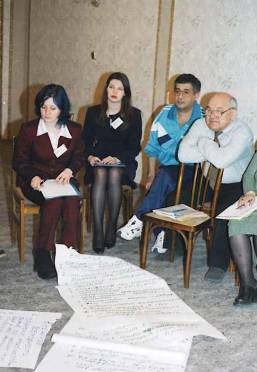 Our training was actually the first in Nizhnij Novgorod (just as in Samara) that was especially dedicated to leaders of national communities. Finally, it was the first meeting of leaders of national communities from Nizhnij Novgorod beyond the city borders. ����������� How they had told us before, the pension was a miniature and comfortable house. The rooms were big and nice and the halls, where the training and work in groups should take place, roomy. And all these premises, including the dining-hall, were situated in one corpus. ����������� The first meeting in the chimney room (even such premises they had there) showed that the participants had expected a set of boring lectures about the sense of life, and about the role of national minority NGOs for the establishment of a shining future. The participation of the leader of the Nizhnij Novgorod patriotic organization �Otchizna� (native country) let us, and especially our trainer, expect a funny and turbulent seminar. ����������� It seemed that the participants would peacefully go in their rooms after the meeting in the evening. But they didn�t. Probably because of the big interest in international contacts one could hear laughter and excited voices of disputants behind the doors till 2 o�clock in the night. And at the end the people sang the song �Ty menya podmanula�. Nevertheless, at 10 a.m. the majority of the participants were on their places. 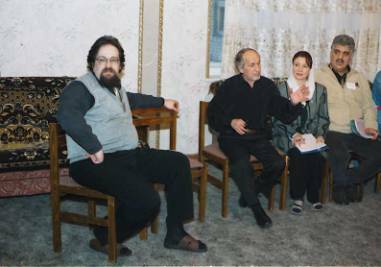 It is true that the representative of the Armenian unity proposed to exchange the chairs for more comfortable armchairs. But Karasev as an experienced trainer had no problems to get back the control and went on with his training program. Every experienced trainer will confirm that the most unsuccessful training is that when the participants are absolutely indifferent towards the trainer�s proposals. But our participants were ardently interested, argued with each other and the trainer, and sometimes they preferred emotions to arguments. Karasev later said that the participants had little motivation but big interest. ����������� Although (like in Samara) the leaders of national communities thought, that they could get more results if they were pulled together, they did not strongly believe in such a coalition. That completely verified our presumption that the efforts of a non-governmental and non-national organization, that is an organization like the Center for Interethnic Cooperation, are necessary to coordinate the activities of different national communities. One of the basic tasks of the training was to teach them that different national communities are confronted with almost the same problems. As Germans, Azerbaijanis, Jews and others have at first sight different mentalities, traditions, customs etc., one actually expects them to have very different tasks to fulfill. But then the training showed that the most of the national communities� leaders suffer from the same affection: their main problem is the lack of financial support. However they seemed to be very sure that they knew how to spent money if they would have some. For the sake of justice it is to mention, that the majority of our officials think exactly that way. Due to that there is the following immortal phrase: �we wanted to make it better, but the outcomes were like always� (My khoteli kak luchshe, a polychilos� kak vsegda). Worth mentioning, that only two of the participating leaders of national organizations had experience in writing grant proposals. The others first had to become aware about the fact that they had to point out their mission before they could start their activities. That is defining the problems they want to solve, the aims and tasks they want to start on, and elaborating strategies how to fulfill their mission. One of the most imported outcomes of the training was that the majority of the participants understood, that they need supplemental knowledge and skills for a more effective work. The work in groups, lively arguments, the cultural program, were doubtless not in vain. Unanimously, the participants noted in the questionnaires that it is necessary to carry out such training courses systematically. The participating leaders of national minorities from Nizhnij Novgorod asked each other why they did not organize such a meeting out of the city on their own. They did not have an answer to this question. At the end of the training course the authority of the training organizers and of Feliks Karasev had grown to the same amount, as the participants liked the technical conditions of the seminar. We emphasized that the laurels for this festive day of friendship and reconciliation are owing to the colleagues of the Moscow office of the Program of Democracy and Human Rights of the European Union, because the trusted in us and granted our program. As expected, nobody of the leaders of national minorities has known about the existence of the Framework Convention on the Protection of National Minorities. But we have to mention that Nizhnij Novgorod is a quite peaceful region concerning international contrasts. There are not so many immigrants and foreigners, and the local authorities show enough tolerance towards national groups. Due to their participation, the representatives of the Administration have become more acquainted with the leaders of national communities from Nizhnij Novgorod and also with the problems they are confronted with. We, the Center for Interethnic Cooperation found new organizations and new people to which we can address in our further work. This is for us a really important result. It means that we are on the right way.